Due to contractual obligations with the Forest Service I have been in the woods a little earlier than usual this year. I’m not complaining, it’s been wonderful watching spring arrive. I began hitting the woods in February and everything, except the conifers and other evergreens, was brown and/or gray. There was a little bird life – chickadees, titmice, juncos, woodpeckers and other winter residents – but not a lot, a few chips and call notes but only an occasional chickadee song. Then in March the maple buds started glistening and soon red and orange flowers started filling the trees. Green shoots and stems began to push through the brown leaf litter giving depth and texture to the forest floor, blue and yellow violets began to appear here and there; there was definitely a change in the air. This past weekend I spent a lot of time in the woods from the Pisgah National Forest near Brevard to the Nantahala near Hiwassee Dam and spring is definitely progressing. I stopped at Richland Balsam Overlook along the Blue Ridge Parkway around noon last Friday on my way to the Pisgah NF. Richland Balsam at 6053 feet is the highest overlook on the Parkway. It was still mighty gray up there except for the spruce and fir. But as I was sniffing around at the edge of the overlook I began to hear black-capped chickadees. The black-capped’s song is only two syllables – “fee-beeee” as opposed to the four part song of the Carolina chickadee – “fee-beeee, fee-baayy.” But the problem is, where the two populations overlap, like along the Blue Ridge, they hybridize rather freely and since the song is learned (it’s a phenotypical song – meaning a combination of genetic and environmental factors) both species plus the hybrids can and often do learn both songs and they look very similar in the field, hybrids, in fact, can produce a combination of physical characteristics. However, the “chick-a-dee-dee-dee-dee” call note is learned differently and is considered to be diagnostic. The black-capped chickadee’s call is lower pitched and slower than the Carolina’s. It has about four “dees” per second while the Carolina call is higher pitched and faster with 6-8 “dees” per second. You may need a second-hand or stop watch to realize this difference in the beginning but once you become accustomed to the two different calls they are pretty easy to recognize. All the calls I heard the other day were from black-capped chickadees. 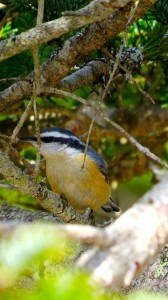 Also present, singing and calling loudly were red-breasted nuthatches. I even heard two winter wrens singing. I saw and heard pine siskins plus heard some golden-crowned kinglets calling. Lower in the Pisgah NF, at the visitor’s center I heard my first-of-season (FOS) yellow-throated warbler, and later I heard my FOS blue-headed vireo and pine warbler. The next day I was in the Tusquitee District of the Nantahala NF and I had a FOS black-throated green warbler near Hayesville and a FOS yellow-throated vireo just west of Murphy. On the drive home through the Nantahala Gorge on Sunday I saw trillium, squirrel corn and spring beauty in flower. In recent years my spring baptism hasn’t occurred till the third week of April when I lead trips for the annual Spring Wildflower Pilgrimage in the Great Smoky Mountains National Park. I wake up one morning, drive to the Park, walk into the woods and – whoa – it’s spring, flowers are open, bees are buzzing, birds are singing and it gives the impression that spring appears overnight. Of course that’s not the way nature works and it’s been a joy to be out and about and see the incremental changes associated with the season of rebirth and promise.